The moderator of this discussion, Mr. Raghunathan V, began by asking Kavita Kane about her motivation behind writing her wonderful book ‘Urmila’–a book on Sita’s sister. Kane explained her motivation saying, “The title itself explains a lot. I didn’t want her as Sita’s sister or Laxman’s wife . She is also said to be Janak’s daughter. Janak fascinated me too. It was during this time that certain parts of the Upanishads were formulated and being the daughter of such a man, I wondered about how she would be.” She also said that she decided to answer her own doubts and fill in the unexplained gaps through her book. 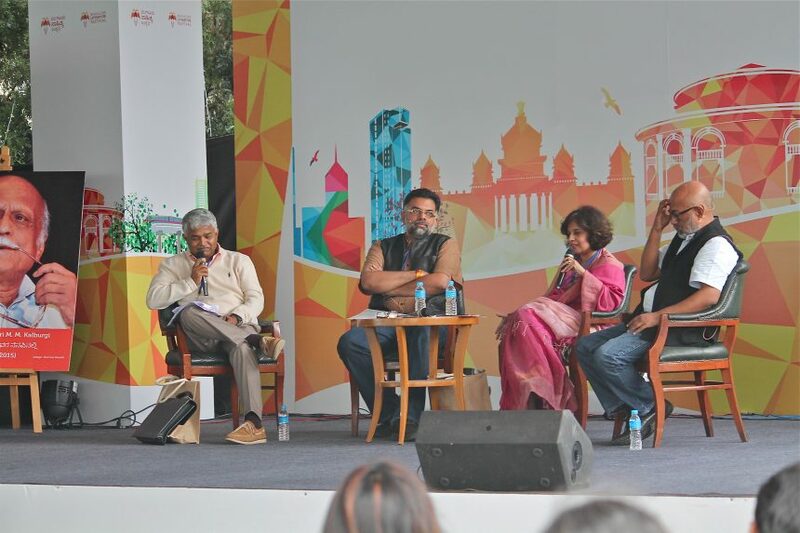 In context with Ramayana and Mahabharata, Kavita said that they are mythological pieces of literature, and one should not attach religious or historic overtones to it. Vamsee Juluri joined the discussion when asked by Ragunathan V to explain the title of his book, ‘Re-arming Hinduism’ and to justify his claim that Hinduism existed even before the Aryan invasion of India. He said that he is a scholar of narratives, that he watches TV and reads Amar Chitra Katha and earns his living by talking about them. “I chose the title, because essentially Hinduism lacks its hand to write its own story,” said Juluri. Akshaya Mukul joined the conversation by talking about Gita Press, on which he wrote his book with the same title. When asked about whether it has enriched Hinduism in the process or taken its sheen away, he replied that they worked on the Hindu mind through various ways. There was too much stress on rituals and religious texts. They also brought out journals which went out to all Hindu homes. “In 1926, they produced a monograph ‘Sridharmprashnotri’, and If I give it to any lady in the crowd here, I will be lynched. They were also the biggest propagators of the four-fold varna system. The most troublesome aspect is about what they talk about women and the varna system. They were the first ones to realize that it is a very difficult to talk; they tried to become the sole spokespersons of the Hindus,” said Mukul. Talking about the famous Arya Samajh Movement, Raghunathan V added that it kept the best of Hinduism in place, and the mumjo-jumbo were removed – all the unnecessary fringes are cut. Towards the end of the discussion, the floor was flooded with questions from the audience that were answered wonderfully by the panelists, acting as the perfect end for this enlightening and interesting session.